Even in the last days of this particularly dreary New York winter, the dish that seems to be on every table at Manhattan’s Lobster Club is a towering ice sculpture designed by pastry chef Stephanie Prida. The four-tiered dessert is painted with vanilla pastry cream and blood-orange syrup before being topped with a single wheel of candied blood-orange. Imagine the most elegant Creamsicle you’ve ever had, simultaneously rich like ice cream, as refreshing as sorbet, and as satisfyingly melty as Dairy Queen soft serve. 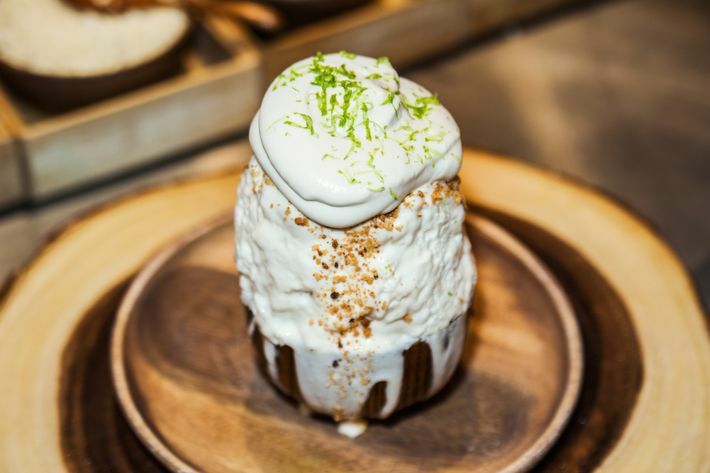 The dessert is kakigori, a traditional Japanese shaved-ice specialty that has quickly become the dessert of choice at some of America’s most high-profile restaurants, and continues to grow in popularity. In its home country, however, kakigori has been popular for literal centuries: The idea dates back to the 11th century, when frozen blocks of ice from lakes would be preserved in the winter, only to be finely shaved and served with sweet syrup to Japan’s elite class in the summers. In the 19th century, when ice became more widely available, the public was able to try it, and now — thanks to electric refrigeration — kakigori is ubiquitous during warmer months. Another aspect that makes kakigori appealing to highly trained pastry chefs is the skill that’s required to make it properly. In Japan, kakigori is a craft unto itself, with masters who have spent decades perfecting their versions of the dessert, which lives or dies by the texture of the ice and the quality of the toppings. Every part of the process is time-intensive: Many shops in Japan source water from the country’s natural springs. 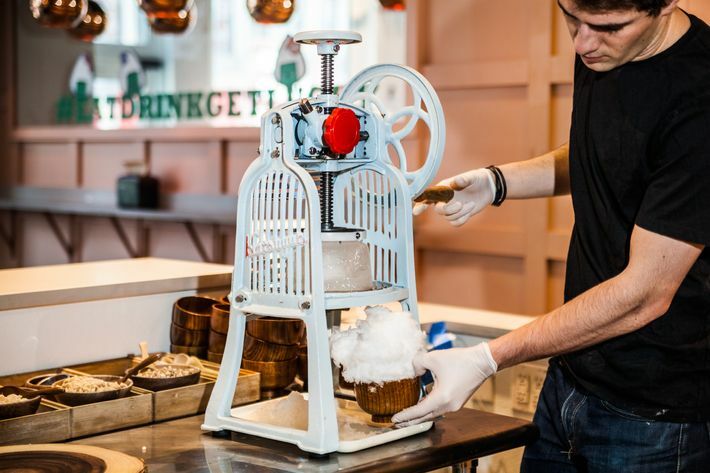 The actual ice is also carefully tempered to make the texture more ideal for shaving, which is performed on specialized hand-cranked machines that slice the ice in layers, like some kind of giant, ancient ice mandoline. And, it goes without saying, the syrups and toppings are all made by hand, with the finest available ingredients. “There is an artisanal element to kakigori,” says Eddie Zheng. He runs the New York dessert shop the Little One with his partner, Olivia Leung. “Every single component has to be made from scratch, so there’s a real appeal there.” The shop’s kakigori selection rotates, but they’ve recently featured bittersweet grapefruit kakigori that includes grapefruit syrup, honey-yogurt panna cotta, flower-shaped grapefruit gelée, brûléed grapefruit segments, and fresh tarragon. At Bonsai Kakigori, Becherano pulls from his Mexican background in a version made with cajeta, a Mexican goat’s-milk caramel, plus malted peanuts and sea salt. 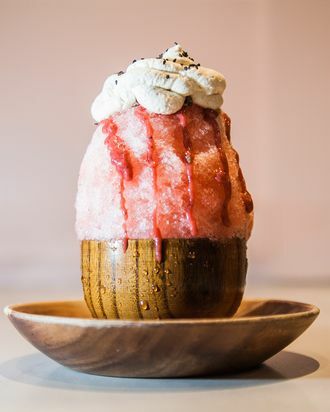 And Katsuya Fukuyama, a Japanese-American chef who serves kakigori at his Washington, D.C., ramen shop, Haikan, during the summer, is working on a version inspired by the tricolor Neapolitan ice cream, a favorite treat from his childhood in Hawaii. The kakigori will have three sections, each drizzled with vanilla, strawberry, and chocolate syrup, with the ice cream itself buried at the bottom.